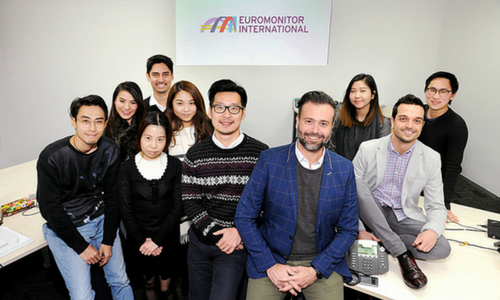 Global market research company Euromonitor International officially opened its Hong Kong office today with the aim of capturing new business opportunities, including those arising from the Belt and Road Initiative. Euromonitor International provides in-depth market research, analysis and consulting across 100 countries. The Hong Kong office is the company’s 14th office worldwide and will manage business in Hong Kong, Macao and Taiwan, including a focus on new services that are related to financial technology, digital and e-commerce sectors, according to the general manager in Hong Kong, Agilson Valle. “We see a lot of growth potential coming from the Belt and Road Initiative, as well as significant infrastructure investment gaining momentum in Hong Kong. The city has always been and will continue to stay strong in logistics, construction and real estate, and will always be the financial centre and service hub for the Asia region. We are confident in the vast development in the Asian continent where abundant opportunities can be found, and we want to be part of it. “The expansion not only addresses the growing demand in serving long-term customers, but also strengthens Euromonitor International’s research in Hong Kong with analysts on the ground. Our new office demonstrates our commitment to growing in Asia as well as our desire to support customers locally,” said Valle. According to Lord, while there are digital and tech talents in the market, most play in the B2C space. ..
Sunway Property has called a creative pitch involving McCann Erickson, Naga DBB and Leo Burnett. Sources informed A+M that Sunway ..